Rugby League - Boothtown Terriers v Ovenden. Nathan Smith for Ovenden. 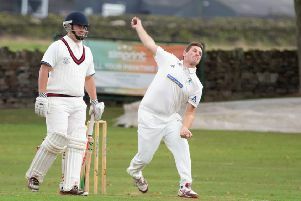 Ovenden’s Pennine League title defence got off to an unexpected start at Upton on Saturday. They were leading the Pontefract side 30-0 at half time when the game was abandoned. Ovenden spokesman Steve Taylor said an Upton commitee member had been red carded at the interval for comments to the referee. “He then claimed to be the Upton first aider and refused to go. The referee eventually had enough and abandoned it,” said Taylor. Taylor said Ovenden “had nothing whatsoever” to do with the abandonment. They were well in control of the game and expected to be awarded the points. The try scorers for the Jake Connor-coached visitors were Nathan Smith, Dean Robertshaw, Mark Sutcliffe, Graham Charlesworth and Sean Dyson. Niall Brady kicked four conversions and Smith one. Championship: Doncaster Toll Bar 54 Stanley Rangers 12, Queens 0 Sharlston Rovers 30 (walkover), Upton 0 Ovenden 30 (abandoned at half time). Division One: Clayton 29 Ossett Trinity 28, East Leeds v Woodhouse Warriors P, Greetland All Rounders 16 Drighlington 36. Division Two: Kinsley Hotel Raiders 14 Illingworth 42, Methley Warriors 16 Eastmoor Dragons 20, Dearne Valley Bulldogs 44 Crigglestone All Blacks 8. Championship: Stanley Rangers v Three Tuns, Ovenden v Doncaster Toll Bar, Upton v Queens. Division One: Ossett Trinity v Hunslet Warriors, Clayton v East Leeds, Moorends Thorne Marauders v Greetland All Rounders, Woodhouse Warriors v Drighlington. Division Two: Eastmoor Dragons v Kinsley Hotel Raiders, Crigglestone All Blacks v Illingworth, Worth Village v Methley Warriors. Division Three: Sheffield Hillsborough Hawks v Sherburn Bears, Beeston Broncos v King Cross Park, Wortley Dragons v Moldgreen, Seacroft Sharks WMC v West Leeds, Cowling Harlequins v Hollinwood.